J K Paper Mills ( jkpm ) of Raygada in Orissa has been rated the greenest paper mill in India. jkpm is followed by Andhra Pradesh Paper Mills Ltd ( appml ) and the Ballarpur unit of Ballarpur Industries Ltd. The significant feature of jkpm is a modern pulping process called rapid displacement heating ( rdh ), which consumes less energy and its fibre efficiency is also high. The amount of bleaching chemicals and water required is smaller. jkpm consumes only about 12 kg of elemental chlorine per tonne of paper produced as compared to most other mills which consume about 100 kg. Sinar Mas Pulp and Paper, based in Pune district of Maharashtra, has also received a high score.It has not, however, been given a rating because the mill was not in operation during the entire period for which the performance of all the other mills was analysed. The mills which came at the bottom of the ratings were Grasim Industries Ltd, based in Kerala, and Amrit Papers and Mukerian Paper Mills, both of which are located in Punjab, and have been operating without a consent for more than two decades now. In the green rating project of the pulp and paper sector, a mill was evaluated using over 100 green criteria under three broad categories - corporate environment policy and management systems, input and process management, and the public perceptions of the mill's environmental responsibility, including that of the local community, non-governmental organisations and the media. jkpm , for example, scored above 50 per cent in both environmental policy and public perceptions but got just 19 per cent in input and process management. Most of the mills that were rated low were found to be having no environmental policy and using outdated technology. Thirty-one plants with a capacity of over 100 tonnes per day were considered for the rating. These mills put together produce over 50 per cent of the country's paper and board. Three out of the 31 mills were closed during the GRP period. The green rating report reveals that the overall environmental health of the sector is not very good. Not one mill could get a five leaves rating (75-100 weighted score) or a four leaves rating (50-75 weighted score). Only two companies scraped into the three leaves category. As many as 12 companies were in the very poor, one leaf category. The sector is plagued by resource use inefficiency, improper sourcing of raw material, outdated technology, and a highly-wasteful and polluting production process. In the early 1970s, wood was dirt cheap and its utilisation efficiency in Indian mills was extremely low. Today, wood constitutes a major proportion of total input cost and most of the Indian mills have performed comparatively better than in the past. But they are far from achieving optimum fibre use. 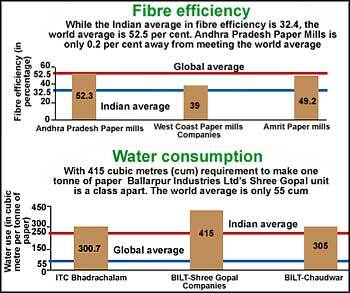 Indian mills, on an average, have a fibre use efficiency of 46.9 per cent, as against the maximum attainable efficiency of 100 per cent. Similar is the case with water, energy and chemical consumption. The global debate over the use of chlorine-free bleaching has largely bypassed the industry in India. Almost all mills continue to use chlorine to bleach paper. Use of chlorine can release organochlorines, including the carcinogenic dioxin, that can enter the food chain. Till now, not even one of the larger mills in India has progressed beyond the use of elemental chlorine in pulp-bleaching to use an oxygen process before bleaching. A few mills are generating chlorine dioxide in order to partially replace elemental chlorine in the first stage of producing pulp for pre-bleaching and second stage as a replacement for hypochlorite. The most recent initiative of some of the progressive, larger mills in India limits itself to the recovery of chemicals from black liquor for reusability. Though the foundations of the modern-day big industrial houses have mostly been the paper and pulp industry, the profits made from this sector have not been invested back into these companies. Today, a modern mill of 100,000 tonne capacity, with a chlorine-free bleaching process, can cost anywhere between Rs 600 to 1,000 crore. But investing in such plants -- though socially and ecologically desirable -- does not excite the industry economically. Freshwater consumption by Indian mills is dangerously high for the health of the water bodies. They should think in terms of harvesting rainwater and recycling its effluents. A calculation made for Sinar Mas, a mill in Maharashtra situated in a dry region, shows that it can meet 50 per cent of its current water needs through rainwater harvesting. The studies also found that almost all the companies are engaged in serious conflicts with the local communities and complaints of water and air pollution are widespread. But some companies like Seshasayee Paper and Paperboards in Tamil Nadu are learning to work with the local people. A change is in the air. But still only a small one.